Brave and Happy: Sway Bar Success! Yesterday, my family finished a few days of camping at our favorite state park. The weather was gorgeous! High temperatures were around 70 degrees and the nights were perfect for sitting around the campfire. Each day, we hiked the trails and took in some incredible Central Texas views! We also hit the water in our kayaks. Only one fish was caught on this trip, and I'm sure he swam back to tell his catfish buddies about his out-of-water adventure! When it comes time to pack up and head out, usually my two boys are willing to help out in whatever way necessary. While they would prefer to act like kids at the lakeside park, they also like the idea of getting home to play with their friends. After an hour or so, I enlisted their help to finish the process of camp clean up. They took care of a few of the obvious things, such as gathering the kayak gear and picking up any little piece of trash. All in all, they do a good job! Once our gear was packed, it was time to hook up the camper. My oldest son did a great job of lining up the ball and hitch and getting the truck in place. The next step was the weight distribution bars and the sway bar. I typically take care of these, but this time, I wanted to see if my son could figure it out. He has watched me several times, but not in the last two months. I asked him to take care of it and he responded, "How do they go on?" My typical reaction would probably be to tell him exactly what to do. That would have been more efficient and easier. He would have complied and the task would have gotten done. A lot of times, we think that if we tell kids each step, they will remember the process next time. But really, the teacher in me knew better. Instead of telling him what to do, I said, "I bet you can figure it out!" Then I walked away. I knew it might be counterproductive to stand and watch. I just might have blurted out some statement and taken away his autonomy. Sure enough, he figured it out and got it done! Sway bar success! This made me happy! He was proud of himself too! 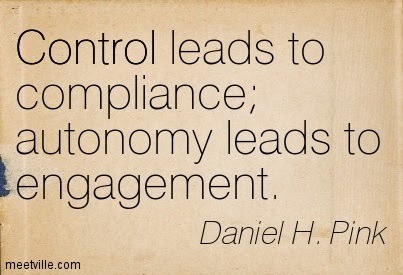 Giving him the autonomy to get it done helped him learn the process way better than telling him each step of the way. It also made him feel better about his accomplishment than he would have if I had told him each step and he had merely complied.